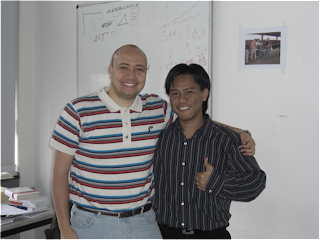 A photo with my dear friend Mohammad Ridwan Agustiawan, after the successful defense of his master thesis. I will not say he was my student or I was his advisor/supervisor, cause I don't believe in vertical relationships in learning. He is just a great friend of mine. 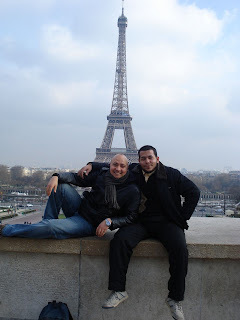 I enjoyed the long discussions we had together when he was working on his master thesis and I learned much from him. I also used to spend a good time with him playing soccer with other friends and colleagues. 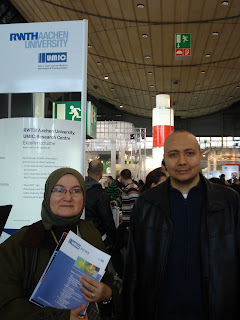 Mohammad Ridwan will start on April 1st at Vienna University of Technology as a research assistant and PhD student, and I'm very happy for him. Below is the 2nd Announcement and Call for Participation EC-TEL 2009. I'm on the publicity chair with my dear colleague and friend Marcela Morales. Please help me in disseminating the conference call through your own network of interested colleagues and friends. Many thanks in advance! I'm Looking forward to seeing many of you in nice NICE! The conference will explore how the synergy of multiple disciplines, ranging from Computer Science, Education, Psychology, Cognitive Science, and Social Science, can provide new, more effective and more sustainable, technology-enhanced learning solutions. It welcomes researchers from European and Non-European countries and industries to present recent advancements from technologies, applications, and learning models in all areas of technology enhanced learning. We invite all researchers across the different fields of TEL to contribute to the scientific landscape of technology enhanced learning. Contributions may address the design of innovative environments, computational models and architectures, results of empirical studies on socio-cognitive processes, field studies regarding the use of technologies in context, etc. All eLearning documentation bringing together new technological developments and learning models are welcome. All submissions will be reviewed for relevance, originality, significance, soundness and clarity by three reviewers. Proceedings will be published by Springer. Besides the main technical program EC-TEL will host workshops on topics related to the conference theme. Workshops promote scientific exchange amongst researchers interested in a particular topic and act as a meeting point for the community. The workshops should provide the opportunity to present and discuss ongoing work and new ideas in the diverse fields of research related to Technology Enhanced Learning. Of particular interest are workshop proposals with an interdisciplinary standpoint, proposals focusing on a specific technology of general interest, or bringing together a sub-community. - Co-located workshops cover topics falling in the general scope of the EC-TEL conference (refer to http://www.ectel09.org/). - They are clearly focused. - There is potentially a significant community interested in the workshop's topic. - Workshop duration can be half a day or a full day. - We advise having more than one organizer and no more than four, preferably from different institutions, bringing different perspectives to the workshop topic. - Programme committee, review process, kinds of submissions expected : (abstracts, short papers, full papers, ...) and planned publishing/proceeding will be taken into account as well. EC-TEL is the leading European conference on theory in Technology Enhanced learning, attracting an increasing number of participants from various communities and sectors. In addition to papers and posters EC-TEL 2009 is seeking demonstrations of novel TEL applications in various sectors, as well as innovative enabling technologies and deployment infrastructures relevant to the main conference topics of interest. The demonstrations track complements the paper, workshop, and poster tracks providing hands-on access to real-world, proven-and-tested applications. Submissions to the demonstrations track must be in the form of a textual description of the demonstration to be given at the conference. The EC-TEL Doctoral Consortium brings together Ph.D. students working on topics related to Technology Enhanced Learning. The Doctoral Consortium will offer Ph.D. students the opportunity to present, discuss, and receive feedback on their research in an interdisciplinary and international atmosphere. The Doctoral Consortium will be accompanied by prominent professors and researchers in the field of Technology Enhanced Learning who will participate actively and contribute to the discussions. The Doctoral Consortium is co-located with and will take place immediately before the EC-TEL 2009 conference. The working language for the Doctoral Consortium will be English. We welcome submissions on all major topics, to those of relevance for EC-TEL 2009. Submissions will be reviewed by at least two members of the EC-TEL Programme Committee. Papers selected will be published in proceedings and authors will present their work in front of other students and senior researchers during the Doctoral Consortium workshop. Each accepted paper will be assigned to at least two scientific advisors who will provide extended feedback on the research. The goal of the symposium is to provide a unique opportunity for Ph.D. students to expose their work to an international group of academics andPh.D. students outside their home institution, enhancing feedback from their supervisors. The Big Question in the Learning Circuits Blog this month is: Workplace Learning in 10 Years. A shared view among almost all respondents is that learning and knowledge work are converging. Tony Karrer summarized the answers in his great blog. 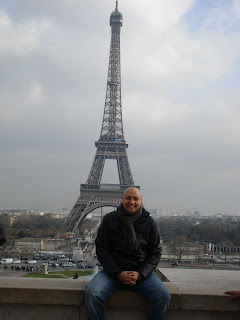 Some photos from the CUELC workshop last week, my short stay in Paris, our visit to CeBIT and the trip to Bonn. A video of a conversation with Eric Schmidt, CEO of Google. You can read the full transcript here. It seems that Netvibes is suffering after Tarik Krim left the company and Freddy Mini took over. Popular start-page service Netvibes may be in its final days as a viable product. The service has been suffering frequent, extended downtime, hasn't been fully functioning even when up and can't possibly be making as much money as its backers hoped it would. - Ms. Doris Frank introduced the RWTH Center for Doctoral Studies. - Armin Schulz from RWTH International Academy talked about "International Communication"
- Hani Sewilam from the Department of Engineering Hydrology in Aachen talked about his experiences in coordinating EU Tempus Projects. - Ralf introduced the new EU IP ROLE. I'll post photos from this event in the next days.